So, we’ve taken our look back at the whole of SHIELD‘s second season. But that’s a very big picture thing, looking at the season as a whole. This week’s Friday Four is going the opposite direction, to showcase 4 of the best moments from season 2. They might be shocking surprises, or awesome camera work, or great character moments, but all four of these scenes stood out in my mind when thinking back on the season. What were they? Let’s find out! And–do I really need to say it?–this list has SPOILERS for season 2. Am I using this picture too much? But it’s so great! 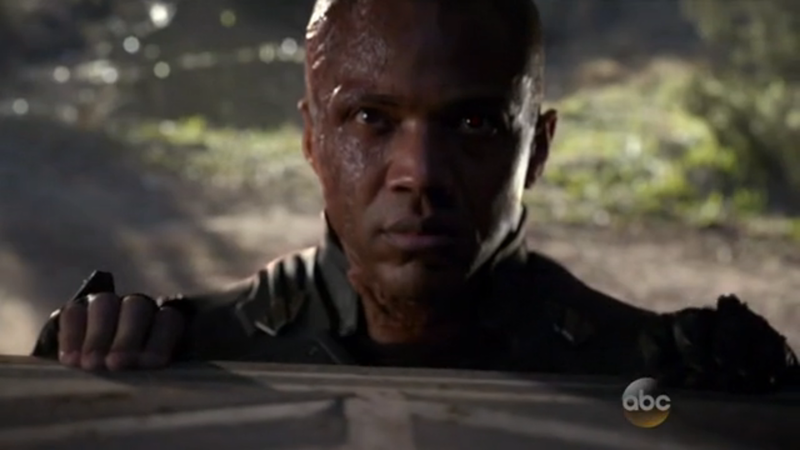 For me, Deathlok had a fairly interesting path throughout the first season, so I was looking forward to his reappearance. I just didn’t see it coming when it finally happened. When “real SHIELD” comes for Coulson and Hunter, it’s Deathlok, AKA Mike Peterson, who ends up coming to the rescue. The reveal was great, as he pulls down on the escaping quinjet and slowly appears over the exit ramp. He then proceeds to kick the guards’ asses and hangs around for a few episodes. His later face-off/team-up with Lincoln was pretty cool too, but if there’s only one Deathlok moment to make the list, it has to be that reveal. Just shooting him is one thing, but a splinter bomb? Dark. One of the most unexpected things this season was the direction that Simmons’ character development took. After Tripp’s death and running into a monstrous-looking Raina, she’s positively terrified of the potential that this alien technology represents. And this sort of fear is a huge motivating factor behind most of her actions in the rest of the season, even when faced with the revelation that Skye is one of them as well. 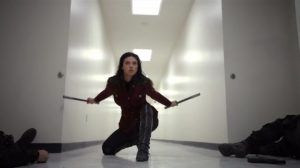 She’s willing to go to extreme lengths that first season Simmons wouldn’t have ever considered; was this some side effect of her time undercover with HYDRA? Who knows. But it starts to affect other aspects of her life, until it finally reaches a head. Their temporary alliance with Ward gives Simmons the chance to get vengeance on him for what he did to Fitz… and shockingly enough, she follows through on it. She sneaks along a splinter bomb, a particularly horrible way to die, plans to use it on Ward, and literally murders Bakshi in the attempt. Wow. That’s the kind of thing that will have some huge consequences moving down the line. You’d think they would’ve played this up more in the commercials! Agent Melinda May didn’t need much time to be established as one of the top tier hand-to-hand fighters in the MCU, so naturally the only opponent she could really give her a challenge… was herself. Well, it wasn’t really another May; just someone disguised as her. But that still made for an awesome fight to watch, and it really emphasized why May has earned her reputation. She’s not afraid to fight dirty, utterly destroying Agent 33’s mask by short-circuiting it. And as I said before, the greatest thing about the fight is that it dodged most of the doppelganger cliches, like having to pick out which is the real one. You really gotta watch this scene to appreciate it. But by far, one of the coolest moments in season 2 was the long take used while following Skye in their assault on the HYDRA base. 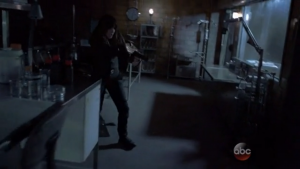 Skye’s development into a full-fledged SHIELD agent reached its peak in season 2, as she trains with May throughout the early episodes to become as controlled and efficient as she is. This shot is where that pays off: Skye takes out goon after goon, using both her firearms training and her newly developed superpowers, which many thought SHIELD wouldn’t be able to convincingly pull off. And beyond the awesomeness of the scene itself, there’s really great cinematography at work here, too, which is something you don’t always get on TV. SHIELD has actually had great luck with directors so far, and this is one of those times that it shows. There were plenty more standout moments from the season, but these four made the top of my list. What do you think? Any scenes you’d have put on the list that I didn’t? Or maybe you didn’t find one of these that great? Leave a message in the comments, or shoot me a message on Twitter @RetroPhaseShift. This is a little different from my usual lists, since it’s focusing on just one show, but hey, why not? And remember, Defiance returns next week! See you then. Ads support the site. Please consider adding us to your whitelist if you enjoy the content here.